Couchgrass has been used in the treatment of chronic skin conditions, gout, and other disorders. Couchgrass rhizome has antimicrobial properties and is a soothing diuretic. Couchgrass gently improves excretion from the kidneys (and bowels) and is said to give relief in cases of kidney stones and to help pass gravel from the bladder. Because the herb soothes the gastric mucous membranes, it is thought to be a very gentle remedy with no side effects. Further helping the urinary tract, Couchgrass is thought to be extremely effective in relieving an enlarged prostate, cystitis, urethritis, prostatitis (especially when combined with Hydrangea) and for urinary tract infections (UTI). It has been quite effective in healing swollen prostate glands and also may be administered to dissolve kidney stones and gravel. It has also been useful in the treatment of colds, cough, sore throat and bronchitis. Couchgrass bears a root with a high mucilage content that is said to be extremely soothing and helpful for problems in the urinary system. It not only helps to ease painful urination, but it is also used to relieve prostatitis, benign prostatic hypertrophy, or BPH, urethritis, cystitis, enlarged prostate, gravel in the bladder and kidney stones. Couchgrass is especially effective in alleviating the occurrence as well as the soreness of urination. It has been used for dysuria (difficult and painful urination), strangury (slow painful urination caused by muscular spasms of the urethra and bladder). This herb has been given to patients with urinary tract inflammation and used successfully to treat urinary tract infections. Couchgrass is usually used in combination with other herbs like Yarrow, Uva ursi (bearberry) and Buchu. The herbal extract is ideal for detoxification of the liver and has been recognized by naturopaths for stimulating the liver's cleansing capabilities as well as promoting the body's natural immunity to fight against diseases easily and for the long term. It has been used traditionally to heal jaundice and additional disorders of the liver. One of the reasons Couchgrass is considered a spring tonic is through its power to increase the number of blood corpuscles and hemoglobin in the blood which, in turn, improves the transport of oxygen to the cells for repairing tissue and renewing interstitial fluids, a solution that bathes and surrounds the cells. Herbal medicine practitioners recommend the use of Couchgrass to treat inflammation, rheumatoid arthritis and back pain. Couchgrass is considered an effective antibiotic that clears infection and is said to be effective against a variety of bacteria and molds. 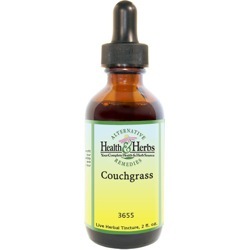 As a rich source of healing mucilage, Couchgrass soothes and relieves inflamed sore throats and alleviates the pain of bronchitis by providing mucilage to coat the inflamed surface. It is said to be excellent in easing laryngitis, caused by the accumulation of phlegm, by making the phlegm more slippery and easier to expectorate, but less effective if the laryngitis is caused by too much shouting or talking. Ingredients: Couchgrass, Structured Water, 20% Alcohol. Non-Alcohol: Couchgrass, Structured Water, and Vegetable Glycerin. Contraindications: Currently, there are no known warnings or contraindications with the use of Couchgrass; however, because it is an effective diuretic, prolonged use may cause low potassium levels in the body. Theoretically, Couchgrass may have an additive effect with other diuretic herbs and supplements.